I've recently downloaded a texture pack that I want to use for Tekkit, but whenever I drag the texture pack file to the correct place (I assume) it always freezes. Can anyone help me with this? Thanks. What do you mean it freezes? Your computer freezes? No, not my computer but the Tekkit screen, so I have to exit it, then reload it again if I want to play it. you want to be dragging the texture pack into the texturepacks folder, not into the tekkit screen. 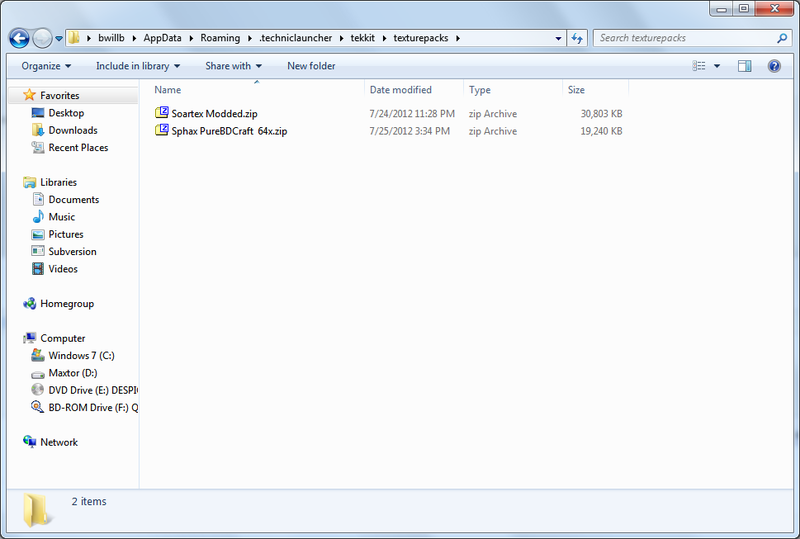 Oh, okay, does the texture pack folder go into the same folder as the technic launcher or does it not matter? I had the feeling you're new to this, open technic launcher, open Tekkit, and put it in the texture pack folder there. Thanks for the suggestion, I will tell you if it works. Thanks, sorry I'm asking all these nooby questions, but do you drag the texture pack folder, or the texture pack itself? I have a mac aswell, could you tell me how you would do it? Yeah, I've done that, what next? No, it's still not there, I tried it on my normal Minecraft and that worked, so could there be something wrong with my tekkit or technic launcher? right, ok, have you located the texture pack file in the tekkit folder? Make sure you have it set up like this. Note the folder structure. right, have you put the downloaded texture pack (purebdcraft) inside that folder? ah missed that part sorry. but once you've found the tekkit folder, it should be the same from there. VM: Java HotSpot 64-Bit Server VM (mixed mode), Apple Inc.
OpenGL: ATI Radeon HD 2600 PRO OpenGL Engine version 2.0 ATI-1.5.48, ATI Technologies Inc.